Allow us welcome our latest improvements, the LP-6 Livepack v.2. IVB7 is the only maker that offers rock reliable trustworthy High definition-SDI and HDMI inputs for you to link your qualified live streaming feed and stream absent instantaneously. With the LP-6, you also have the options to alter the encoding configurations at a incredibly granular degree. Hardly ever has it been so straightforward for news channels to live stream from any place immediately applying these kinds of a portable touchscreen battery operated advanced movie broadcast program. Consider just carrying your digital live generation studio whereever you go. That is what the all new LP-6 v.2 is all about. It can be used for Live Mixing with constructed-in Touch Screen & Multi-monitor. It can be applied for complete post output with any movie enhancing software. It is fully outfitted for very low velocity & substantial speed Internet Webcasting . It is equipped for Tv Broadcasting, news, compering & video clip conferencing with Expert Mike for reporters from anyplace. It can Live Relay Comprehensive Hd Video to Television , LED Wall & Projectors from Any place to Everywhere. It can Broadcast on many social media websites simultaneously -eg. YouTube, Fb & Twitter etc. It can specifically convert any unrestricted films to be stored on internet sites. Moreover,It has the latest Intel Nth Generation i7 Processor can also be utilised as a ordinary Desktop or Notebook so that all you require to have is A person unit when you’re on your way to produce your news feed or outdoor live event. 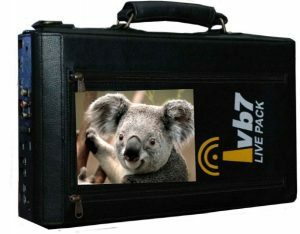 Call us at +91-9789-9789-81 and e-book your IVB7 Livepack now. V.2 signifies additional electric power in your hands on the go. The LP-6 is appropriate with any live streaming server having said that we recommend that you use LIvebox live streaming server to have the finest live streaming attribute because of to the change-CDN and other further alternatives that are existing in Livebox. Previous Previous post: What’s all the buzz about this new Livebox? Next Next post: How to strengthen your small business as an MSO?